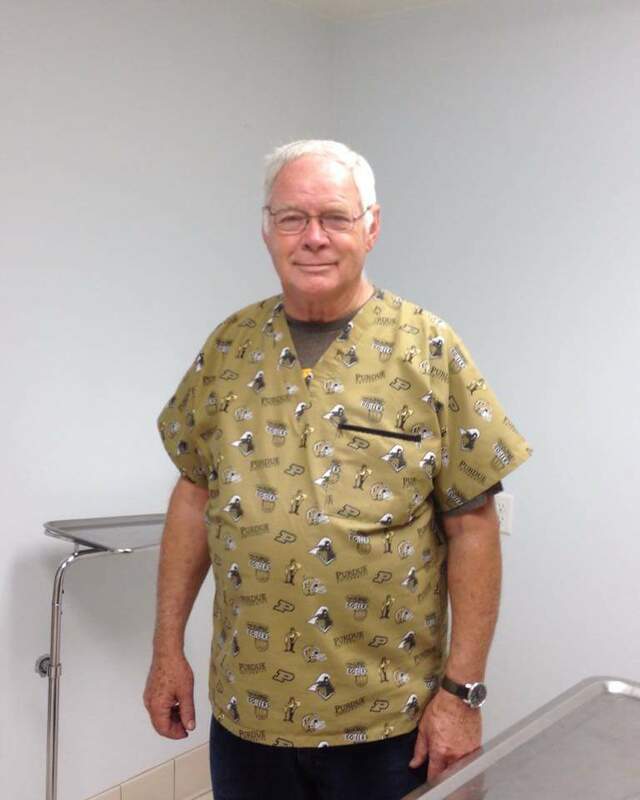 Dr. Jim was born in Randolph County and grew up on a dairy and swine farm. He went to Purdue to be a vo-ag teacher and ended up teaching biology. While teaching biology, Jim was inthralled by the interaction of all the body systems and wanted to learn more of how God had created the human body. He quit teaching and went to work for U.S. Steel at their Gary Works. After several applications to Purdue, he was finally accepted into veterinary school but was in a quandary about leaving his general foreman's job and taking on a large debt to go back to school. That was the best career decision because he loves being a veterinarian. Along the journey he served in the U.S. Army Reserves for 28 years, was activated for Desert Storm and retired in 1996 as a LTC. He was commander of an airborne company, a chemical officer, and intelligence officer. He loves to joke around and talk to his clients, many of whom have turned out to be friends. One of his favorite activities at the clinic is testing students on the gum ball machine to determine if the have been "good or bad". He was the president of the Dunkirk Kiwanis Club for 19 years. Now he continues as a member and enjoys all the projects they do for Riley Children's Hospital and local charities. He has also served on the Jay County Board of Health for 20 years (3 years as chairman). He is past president of the Northeast Indiana Veterinary Medical Association. He is past retirement age and only works eight months of the year, spending four months in Florida playing volleyball! It is hard work, but hey, somebody has to do it! See Dr. Teresa's bio for more information on Dr. Jim. Dr. Teresa was born and raised in Montgomery County in west central Indiana, the daughter and granddaughter of farm business families. In addition to helping care for family pets, Teresa and her brother maintained a small sheep herd. Her share of the profits was eventually used to purchase a microscope required by veterinary school. The decision to become a veterinarian was factored in regard for animals, a desire for an academic challenge, and a "strong stomach". An undergraduate degree in Animal Science was earned followed by a Doctor of Veterinary Medicine at Purdue University. She met Dr. Jim, her husband, in veterinary school, both in the same class. Upon graduating from veterinary school, Dr. Teresa along with Dr. Jim took up residency in Jay County purchasing a veterinary practice in Redkey from Dr. Max Peters. The early years were spent raising four children and helping in the practice. When homeschooling of the children was completed, Dr. Teresa was in the clinic full time. She enjoys attending continuing education meetings to learn the latest in veterinary medicine. In addition to four children, Dr. Teresa (and Dr. Jim) are blessed with ten grandchildren, all of whom are boys so far! The grandmother role is rewarding and pleasurable in spite of not being "as young as I once was". Dr. Teresa (and Dr. Jim) attend University Christian Church in Muncie, IN and involve themselves in the life of the church. One dog, Laird, and three cats, Ibid, Reep, and Zelda, make their home with Dr. Teresa and Dr. Jim. Laird is part lab, so throw a ball for him and he is your friend for life. Dr. Wasson is an associate veterinarian for Redkey Veterinary Clinic who enjoys surgery, medical cases, and interacting with his clients and patients. He also works in a relief role at VCA Northwood Animal Hospital in Anderson, IN in their general practice and emergency practice departments. Dr. Wasson graduated from Iowa State University College of Veterinary Medicine in May ’14. His main area of interest is small animal clinical medicine and surgery, although he enjoys all aspects of working with both small and large animals. Dr. Wasson’s veterinary education was challenging and rewarding, if not somewhat non-conventional. He was accepted into Ross University School of Veterinary Medicine on the island of St. Kitts in the Caribbean in spring of 2010. He spent 16 months at Ross before transferring to Iowa State where he completed his education. Dr. Wasson is the second son of Drs. Jim and Teresa Wasson, the owners of Redkey Vet Clinic. He was an avid “tag-along” since he was a young child with Dr. Jim on farm calls and in the office. Becoming a veterinarian was his goal from a very young age. He was inspired to follow his parent’s footsteps and loves the challenges and variability of his profession. Dr. Wasson and his wife Missy have four boys: Brock-8 yrs old, Tyler-7 yrs old, Parker-3 1/2 yrs old, and Jake 2 yrs old. They enjoy various sports, swimming, and other outdoor activities together. Their household is made complete with three dogs: Ted, Phil and Shelby, and two cats: Sunflower and Motor. Dr. Wasson is an active member in his church, currently serving as a deacon and on the men’s ministry board. He is a member of the Indiana Veterinary Medical Association, the Northeast Indiana Veterinary Association, and the American Veterinary Medical Association.